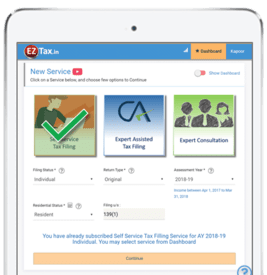 Fastest, easiest Self-Service Online (DIY) Income Tax e-Filing in India, AY2019-20, covering ITR1, ITR2, ITR2A, ITR3, ITR4S, ITR4. 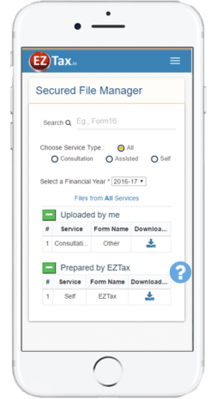 Upload Form16 and save with Tax Optimizer. 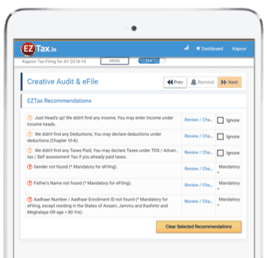 Also allow to eFile Original, Revised, and Belated filing types online and for FREE. 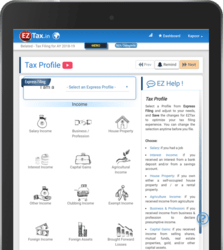 With EZTax self service tax efiling, you no longer need to deal with another professional in filing your taxes. 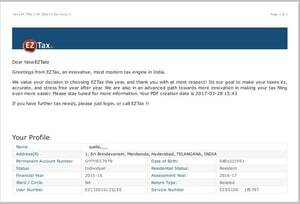 EZTax.in is the 1st and only software available pan India to provide step – by – step guidance thru EZHelp in making your filing an experience.